It is important recognize there are two areas that effect the airway: 1) The upper airway regions which includes the nose, turbinates and adenoids and 2) the oral cavity, tongue and pharyngeal throat regions. 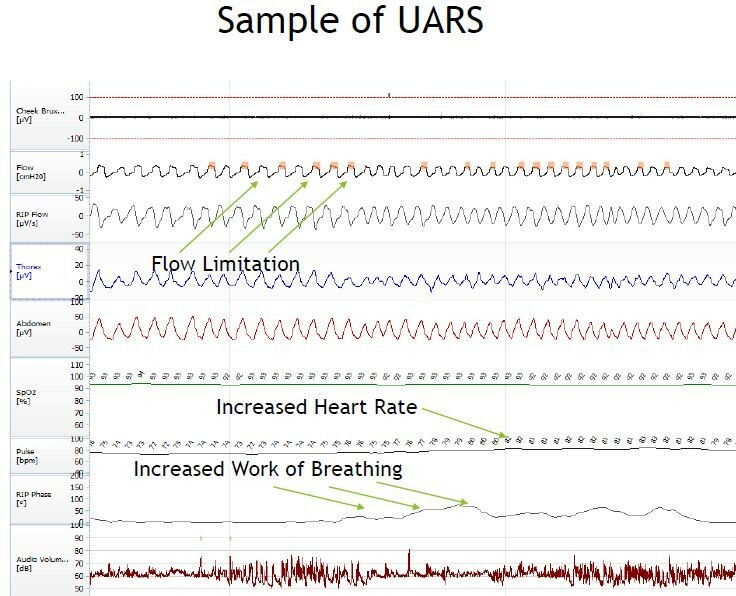 The upper airway can have what is known as UARS (Upper Airway Restriction Syndrome) and the lower regions are recognized to have OSA (Obstructive Sleep Apnea). When evaluating these areas of breathing it is important to consider how the tongue influences the cardiopulmonary effects on oxygenation and quality of restful sleep. Cardiopulmonary Coupling (CPC) is a way to look at the patient’s sleep and breathing at night. It is a very objective and detailed method very similar to the K7 of sleep. I like it for the same reasons that I like the K7 for my bite recordings. “If it’s measured its a fact, if not it’s an opinion”. What CPC does is it looks at the cardiac effort during sleep, and then it couples that with the pulmonary effort which allows you to measure the patients’ overall respiratory effort. That is how much work they are doing to breath. You can think of it like a car (or Harley-Davidson, or mini-van depending on your ride 🙂 where you are monitoring how hard the engine is working verses how fast you are going. They should be coordinated and working in synchronous just like the heart and lungs of the patient. More specifically it is the RERA that should be of concern. RERA shows when the patient is in sympathetic sleep or para-sympathetic sleep and when and how much they cycle back and forth. This is where the real damage comes in: the elevation into sympathetic sleep (and we know how damaging a chronic sympathetic state can be. Patients that have UARS (Upper Airway Resistance Syndrome) are those that exhibit RERAs. UARS is an elevated respiratory work effort. Oxygen Desaturation Index (ODI) is the number of times per hour of sleep that the blood’s oxygen level drops by 3 percent or more from baseline. ODI is a standard measurement used in sleep studies, such as a polysomnogram or overnight oximetry. Decreased oxygen levels are called desaturations. ODI is measured by an oximeter, which is a device typically placed on the fingertip that shines a red light through the skin and can estimate the amount of oxygen in the peripheral blood. Apnoea–Hypopnoea Index (AHI) is the number of apneas or hypopneas recorded during the study per hour of sleep. It is generally expressed as the number of events per hour. 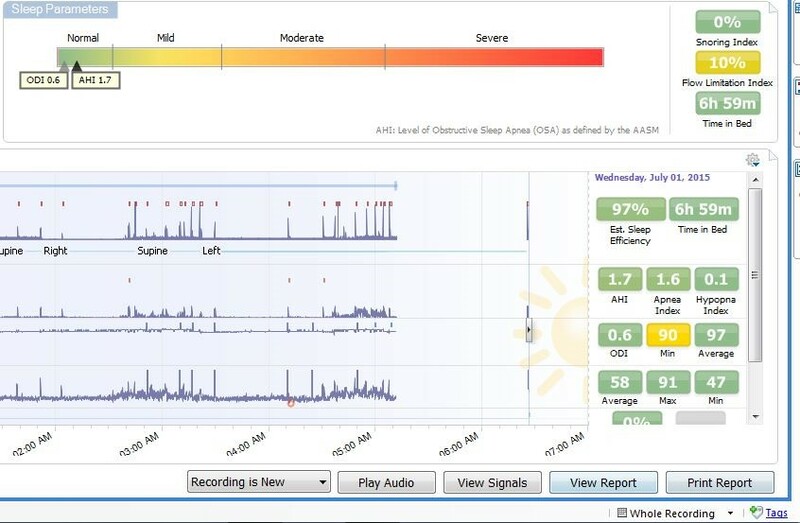 Combining oxygen desaturation with AHI gives an overall sleep apnea severity score that evaluates both the degree of oxygen desaturation (low blood level) and the number of sleep disruptions. So it’s not the fact of does the patient breath or not, but rather what price are they paying to breath? The body’s #1 task to get oxygen to the vital organs no matter the price. It parallels occlusal interferences: it’s not just the interference that the patient hits that cause pain and dysfunction, but it is also the ones that the patient torques to avoid that can cause horrible pain and dysfunction. Here is a sample of a patient who has low ODI and AHI values (0.6 and 1.7) yet is showing UARS.